He has inspired scores of people, spanning all ages and nationalities, to photograph his likeness in all sorts of temperatures and hours of the day. He spawned clusters of street stalls selling black market products bearing his likeness and rejuvenated a local company who had already been making money off his mischievous, yet knowing, countenance. He has moved grown adults to tears when it was feared that his untimely demise was, indeed, permanent – sparking many a conspiracy theory, and accusations flying across the border between Hong Kong and mainland China. And he didn’t even have to stand behind a podium to create this cult of personality. 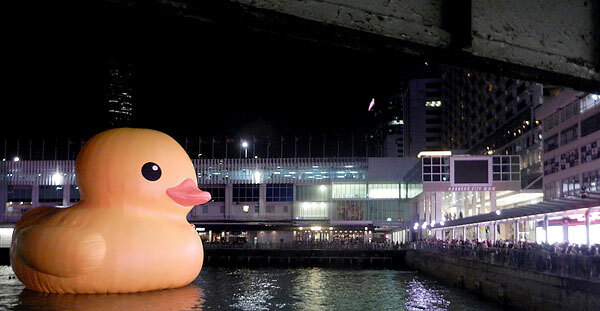 Yet when the inflatable 16.5-meter subject of Florentijn Hofman’s Rubber Duck Project sailed into Victoria Harbour, no one could quite predict the idolatry that would ensue, to the point that the police had to put up barricades to make sure that shoppers could enter and exit the adjacent Harbour City mall. Could the cause be traced to the Sanrio effect? 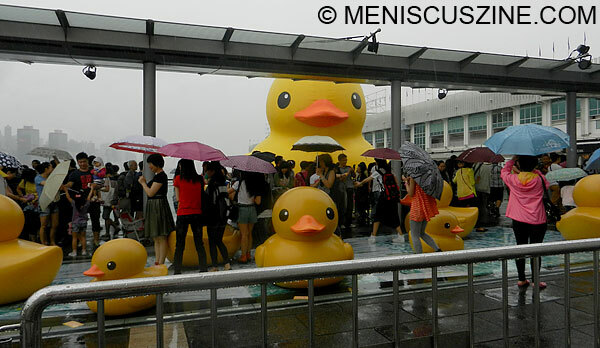 Unlikely, because Rubber Duck had already made Japan – the king of cute corporate mascots – one of its first stops in 2009, and its temporary residence there did not generate this much buzz. What about social media marketing? Maybe, as his picture certainly has proliferated on the Internet more easily today than several years ago. One thing is for sure: the Rubber Duck has a savvy knack for timing. He deflated May 15, returned on the 21st, survived a five-hour black rainstorm signal the next day and stayed afloat just in time for the inaugural Art Basel Hong Kong. In contrast, his archrival, Paul McCarthy’s “Complex Pile,” a giant mound of dung in West Kowloon, drew laughter when it deflated the first time and suffered a badly-timed second fate when it and the rest of the “Mobile M+: Inflation!” exhibit suffered massive flooding – knocking it out of commission during the entire Art Basel Hong Kong festivities. 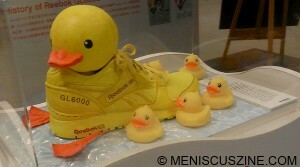 Perhaps Rubber Duck’s appeal lies in something more profound, as Hofman describes it himself. “The Rubber Duck knows no frontiers, it doesn’t discriminate people and doesn’t have a political connotation,” states Hofman on his website. “The friendly, floating Rubber Duck has healing properties: it can relieve mondial tensions as well as define them. 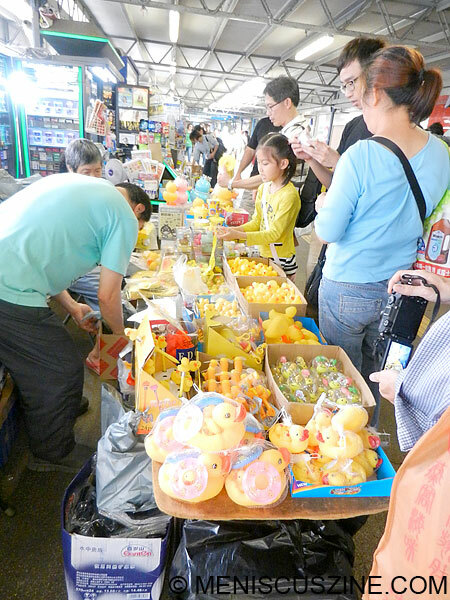 The rubber duck is soft, friendly and suitable for all ages!” Indeed, that appeal is probably what influenced actor Andy Lau to cheekily pose with the Dutch artist and Rubber Duck in several pictures. Again, just in time for Art Basel Hong Kong. 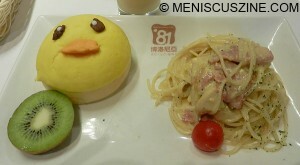 The Rubber Duck permanently sails away from Hong Kong on June 9. He can be viewed next to the Harbour City shopping mall in Victoria Harbour. Admission: free. Take the MTR or the Star Ferry to Tsim Sha Tsui. The duck’s next stop is reportedly somewhere in the United States.